"Sampath Speaking" - the thoughts of an Insurer from Thiruvallikkeni: Nations Parade at Rio Olympics : why USA is not last ! and why Tonga is in news !! Nations Parade at Rio Olympics : why USA is not last ! and why Tonga is in news !! They are in news and Internet search engines are busy …. Tonga, officially the Kingdom of Tonga, is a Polynesian sovereign state and archipelago comprising 169 islands of which 36 are inhabited. Tonga stretches over about 800 kilometres; surrounded by Fiji and Wallis and Futuna (France, Samoa to the northeast, Niue, Kermadec (part of New Zealand), New Caledonia (France) and Vanuatu. The country accorded reception to Capt James Cook in 1773. Till 1970s, Tonga had British protected state status, with the United Kingdom looking after its foreign affairs under a Treaty of Friendship. Mário Rodrigues Filho, was a Brazilian journalist and writer. The Rio Olympics officially started with a long and loud celebration of Brazilian culture that also featured some unfortunate reminders of the troubled backdrop to these Games. The 31st Olympiad was open in Rio after a stunning opening ceremony at the Maracana stadium. All 207 countries plus the refugee team walked at the Parade of Nations. As part of the tradition, Greece led the parade followed by other countries in alphabetical order ** The refugee team was the second last to come and the last were host was Brazil. After the Parade of Nations, IOC president and chairman of the Olympic organising committee Nuzman addressed the gathering and later acting president of Brazil Michel Temer announced the Games open. The dominant images from the four-hour opening ceremony at the Maracana Stadium were supermodel Gisele Bundchen's catwalk across the pitch to The Girl From Ipanema, the joyous arrival of Brazil's team and former marathon star Vanderlei de Lima lighting an Olympic cauldron that morphed into a golden disco ball. But the boos that greeted acting Brazilian president Michel Temer's short address to open the Games, the smattering of jeers the Russian team received and the catcalls that followed a reference to government funding tell a different story. The venue - Maracanã Stadium, is a football stadium in Rio de Janeiro, Brazil. The stadium is part of a complex that includes an arena known by the name of Maracanãzinho, which means "The Little Maracanã" in Portuguese. Owned by the Rio de Janeiro state government, it is named after the Rio Maracanã, a now canalized river in Rio de Janeiro. It was opened in 1950 to host the FIFA World Cup, in which Brazil was beaten 2–1 by Uruguay in the deciding game. The official name of the stadium, Mário Filho, was given in honour of the journalist. During the Parade of Nations within the Rio de Janeiro 2016 Summer Olympics opening ceremony, athletes and officials from each participating country marched in the Maracanã Stadium preceded by their flag and placard bearer. In keeping with Olympic traditions, Greece, the birth place of the olympic games that started in 1896, entered first, while Brazil, the host nation, went last. The Refugee Olympic Team, composed of refugees from several countries, went second to last and received a standing ovation. Other countries entered in an alphabetical order in the language of the host country (Brazilian Portuguese). Beijing Olympics gold medalist Abhinav Bindra, competing in his fifth Games, led the Indian contingent. The Indian men were attired in navy blue blazers and trousers, white shirts and ties, while the women looked elegant in yellow and navy blue sarees. The 33-year-old Bindra is till date India's only individual gold medallist at the Olympics. The shooter achieved the feat when he clinched a historic gold in the 10-metre air rifle event at the Games in 2008. 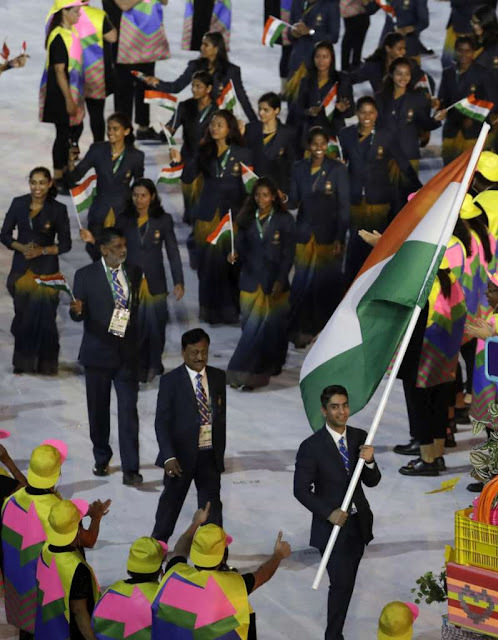 Success in shooting will be key to India's hopes of surpassing the London Olympics' six-medal haul, and the performance of Jitu and Bindra will be crucial to achieve that aim, while the likes of Gagan Narang, Manavjit Singh Sandhu, Heena Sidhu and Apurvi Chandela can also fetch medals. Long accustomed to coming late in the program, the U.S. team was introduced a little before the midway point in the parade of athletes. Because the ceremony is done in the language of the host country – and USA is Estados Unidos da America in Portuguese – the Americans got their march earlier in the program. Other countries saw their order shift, as well. Germany, for instance, was the fifth country introduced. In Portuguese, it’s Alemanha. Saudia Arabia, or Arabia Saudita, entered as the ninth country in the parade.